The profile contains of different blocks. The information you add into these blocks will be used when you later create a Resume. The information is also searchable and makes it possible to match your experiences to the skill requirements of a project. Below you find information about each block and a short video of how to add information in these blocks. 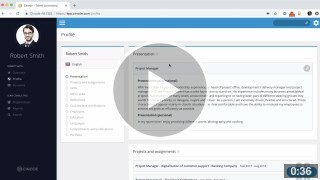 Presentation: Use the Presentation (professional) and fill in Title and Presentation. Your presentation will be used in your Resumes so give it some time. Summarize your Personal and Professional characteristics and your Professional experience of interest. Use the presenation Personal if you have Company specific instructions for that. For every assignments add; Description (Tasks, responsibilities and results). Tag your keywords/skills (one at a time!). That could be Industries, Roles, Tools, Techniques etc. When you start writing a skill you will get suggestions, use these. If a keyword is missing, you can add that as well. Be accurate about spelling. Skills: In the block Skills, all added competencies from the assignments are listed. If you miss a skill you can also add that manually with the button ”Add”. Set your competence level 1-5. For definitions of levels, click on the link Do you need help assessing your level availible when clicking the pen. Other skills: Add for example Driver license and Military Service. References: Add references to gather all important information in one place. Courses and certifications: Add your courses and certifiations. Seperate University Courses should be added here. Employers: Roles within employment are registered as assignments under Projects and assignments. Just list your former Employers here. Languages: Add languages and level. Commitments and publications: Add for example board membership, publications and other relevant commitments. Portfolio: Upload for visualizations or attach files. Note: If you have already created Consultant profiles they will get a small yellow warning that indicate profile updates.